For other uses, see Bree. Bree is a city in the Flemish province of Limburg, Belgium. On January 1, 2006, Bree had a total population of 14,503. The total area is 64.96 km2 (25.08 sq mi) which gives it a population density of 223 inhabitants per square kilometre (580/sq mi). The mayor of Bree is Liesbeth van der Auwera. Bree is also known as the jewel of the Campine. ^ "Weatherbase: Historical Weather for Bree, Belgium". Weatherbase. 2011. ; retrieved November 24, 2011. 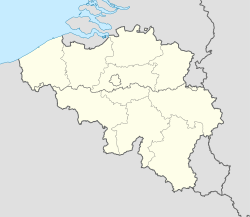 Wikimedia Commons has media related to Bree, Belgium.